Over the last several days, Blizzard has released Overwatch gameplay footage featuring Zenyatta, an "omnic monk" support character, and Mercy, a winged medic. 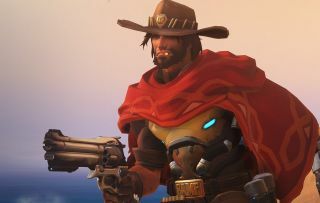 Now it's time for a look at McCree, a "mad dog" gunfighter with a smooth drawl and a sci-fi six-shooter called the Peacemaker. I'm willing to be it isn't all that peaceful. McCree's profile describes him as a 37-year-old bounty hunter hailing from New Mexico, who was a member of the Overwatch covert ops division Blackwatch prior to leaving the organization entirely. Along with his sidearm, he also carries flash-bang grenades, can simultaneously dodge enemy fire and reload his weapon in a combat roll. His ult Deadeye ability involves a volley of hipfire that will hit every enemy in his line of sight. He also wears a belt buckle that says "BAMF," I guess because he's a big fan of the X-Men character Nightcrawler. McCree seems like a pretty straightforward character—the kind of guy you want to be when all you want to do is shoot stuff. And really, deep down, isn't that all of us? Sign up for the Overwatch beta, which is expected to begin later this year, on Battle.net, and find out more about what's cooking in our February hands-on.